With the affordable, 238-mile-per-charge Bolt, Chevy brings zero-emission motoring to the masses. They even made it fun. The near-silent Bolt EV drives with a crispness you wouldn’t expect from an affordable (read: non-Tesla) EV, let alone a commuter-focused Chevy. The strength of its 200-horsepower electric motor proved gutsy enough to surge past traffic on Bay Area freeways without worry. In the hills, its chipper turn-in and low center of gravity gave it the charisma of a hot hatch. There’s no need to stop at 7-Eleven for a Red Bull to stay awake behind the Bolt’s wheel. The tall, clipped, crossover-like profile of the Bolt EV lacks the design fluidity of Tesla’s future competitor, the Model 3 (expected late this year), but the Bolt’s utility will win you over. Its interior space is damn near lofty, with ample legroom in front and enough acreage for two adult butts in back (three in a pinch). The cargo-swallowing rear hatch is killer; the cost-cutting array of plastics on the instrument panel is not. The Bolt hits the impressive benchmark GM set for this car back in 2015: getting 200-plus-mile-range electric wheels on the road at around $30 grand. But because the actual price is $37,495, the low cost is dependent on a $7,500 federal tax credit for buying an EV — an Obama-era incentive with an uncertain future. Still, as it stands, the Bolt EV makes zero-emission driving realistic for the first time ever. Score one for Detroit. Thus far, affordable EVs — like the Nissan Leaf and Kia Soul EV — suffered from anxiety-inducing mileage ranges in the high double-digits. They tended to make you look down every few seconds at a battery level in free fall. 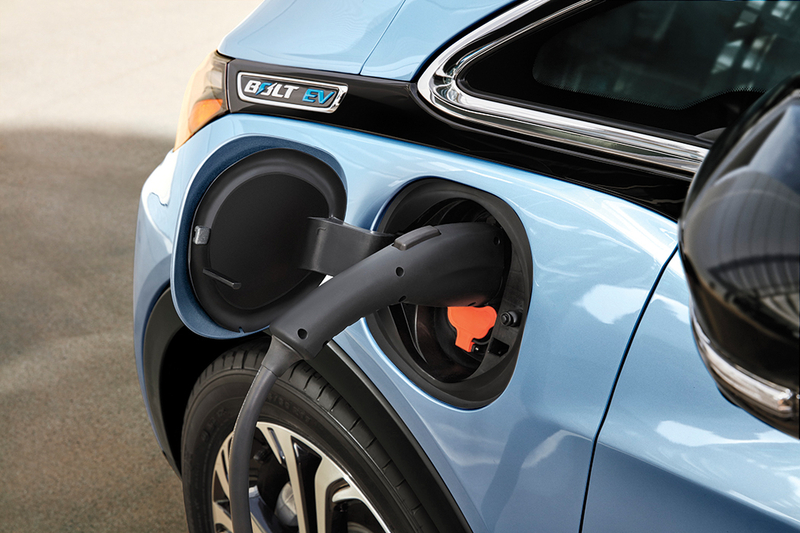 Not so with the Bolt EV, since its 60-kWh battery pack is good for an average of 238 miles per charge. And if you slip it into “low” mode, you’ll likely eke out even more — and rarely have to hit the brake pedal. The setting enables one-footed driving, essentially: The more you come off the accelerator pedal, the more the Bolt’s regenerative brakes scrub off speed until you stop, recapturing power in the process. Within minutes, the method feels like second nature. Deplete the battery’s capacity (a rarity) and a recharge from a 240-volt plug will take nine hours.